Plants cespitose or rhizomatous, green to purplish, sometimes glaucous. Culms 7-210 cm tall, usually 1-3 mm thick, not rooting or branching at the lower nodes. Sheaths rounded or keeled, glabrous or pubescent, sometimes glaucous; ligules 0.5-2 mm, collars neither elongate nor narrowed; blades 7-105 cm long, 1.5-9 mm wide, without a longitudinal stripe of white, spongy tissue. Peduncles 0.8-10 cm; rames 2.5-8 cm, partially to completely exserted, usually somewhat open; internodes 3-7 mm, usually arcuate at maturity, ciliate on at least the distal 1/2 (sometimes throughout), hairs 1.5-6 mm. Sessile spikelets 3-11 mm; calluses 0.5-1(2) mm, hairs 0.3-4 mm; lower glumes glabrous; upper lemmas membranous throughout, cleft to 1/2 their length; awns 2.5-17 mm. Pedicels 3-7.5 mm long, 0.1-0.2 mm wide at the base, flaring above midlength to 0.3-0.5 mm, straight or curving outwards. Pedicellate spikelets 0.7-10 mm, sometimes shorter than the sessile spikelets, sterile or staminate, unawned or awned, awns to 4 mm, when sterile, the lemma usually absent. 2n = 40. Schizachyrium scoparium is a widespread grassland species, extending from Canada to central Mexico. 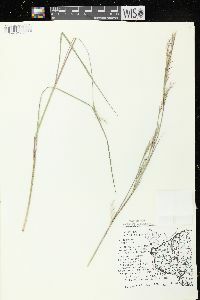 It is one of the principal grasses in the tallgrass prairies that used to dominate the central plains of North America. It exhibits considerable variation, much of it clinal. The following varieties are recognized because they are morphologically, ecologically, and geographically distinctive. Perennial tufted or rhizome-bearing herb 7 cm - 2.2 m tall Leaves: with open sheaths that are rounded or longitudinally ridged, hairless to hairy, often covered with a whitish waxy coating (glaucous). The membranous ligules are 0.5 - 2 mm long, while the blades are 7 cm - 1.05 m long and 1.5 - 9 mm wide. Inflorescence: terminal and axillary, consisting of 2 - 8 cm spikes. Fruit: a caryopsis. Culm: 7 cm - 2.1 m long, 1 - 3 mm across. Spikelets: either stalkless or stalked. 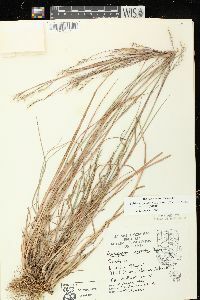 The stalkless spikelets are bisexual or sterile, 3 - 11 mm long, with two florets. Stalked spikelets sterile or male, 0.7 - 10 mm long, with one floret. Glumes: longer than the florets, lance-shaped to linear, membranous. The lower glume surrounds the upper glume, has two light longitudinal ridges and is hairless. 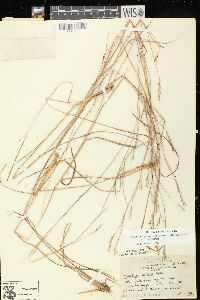 Florets: borne on stalkless spikelets have sterile lower florets that are reduced to transparent lemmas, and bisexual upper florets with three anthers and an upper lemma that is membranous, cleft to the middle, and awned (2.5 - 17 mm long). 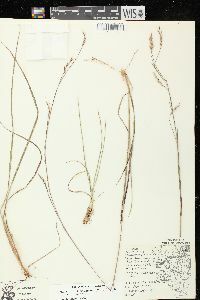 Those borne on stalked spikelets have male florets with transparent lemmas that may or may not be awned and sterile florets that usually lack lemmas. Culms loosely or densely tufted, 5-12 dm, often freely branched above; herbage often glaucous; blades 3-7 mm wide; rames long-exsert, bearing 5-20 sets of spikelets on a straight or flexuous, white-ciliate rachis; glumes 5-10 mm; awn 7-14 mm, twisted near the base; sterile pedicels usually in pairs, densely ciliate, often spreading, each bearing a vestigial spikelet 3-10 mm (awn included); 2n=40. Dry soil, old fields, prairies, and open woods; N.B. and Que. to Alta., s. to Fla. and Mex. 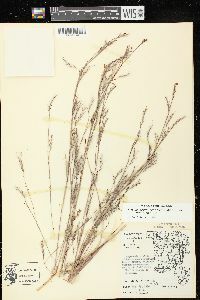 Abundant and highly variable, an important constituent of tall- and mixed-grass prairies. 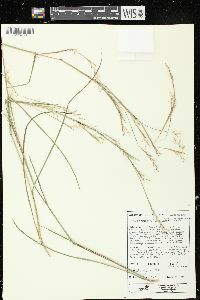 (Andropogon s.; A. praematurus, a smutted form of this or of some sp. of Andropogon) Three vars. with us.